In the summer, I hardly ever want to cook because it’s so effing hot! The good thing about this recipe is even though it requires you to cook for a minute, it takes under 5 minutes to make this recipe. Can’t beat that, right?! 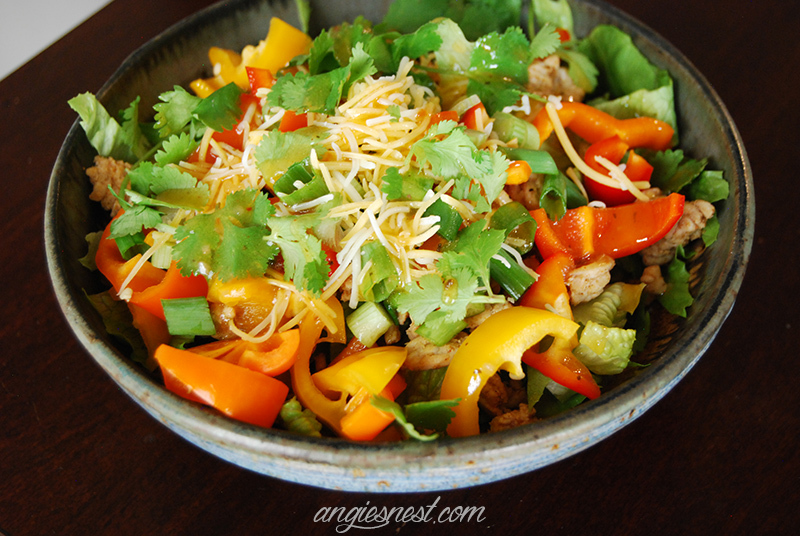 Fajitas are one of my go to favorites, but this is a lighter, cooler, healthier version. Add olive oil to a saute pan and cook chicken, salt, spices and onions on high heat until cooked through. Add in sliced peppers, stirring until very lightly cooked, only about 1 minute and set aside. divide lettuce into individual bowls and add sauteed mixture on top, followed by cheese, cilantro, and dressing. It is a healthy food salad and very easy, it also takes few minutes to prepare.